Pro snowboarder Markus Kleveland spins a 270 to frontside boardslide on the flat-down tube at 2016 Dew Tour in Breckenridge. The 2017event from Dec. 14-17 will serve as an Olympic qualifier for the 2018 Winter Olympics in PyeongChang, South Korea from Feb. 9-25. The 2018 Winter Olympics is less than six months away and Breckenridge is now the first televised test of the season for superstars like Mark McMorris, Bobby Brown, Jamie Anderson, Henrik Harlaut and dozens of Olympians-in-waiting. On June 21, Dew Tour and TEN: The Enthusiast Network — the outfit that took over Dew Tour in 2016 and publishes Transworld Snowboarding, among other publications — announced that the annual ski and snowboard bash in Breck from Dec. 14-17 now serves as an Olympic qualifier. Qualifying events include: men’s ski and snowboard slopestyle, men’s ski and snowboard halfpipe, women’s ski and snowboard slope, and women’s ski and snowboard pipe. Dew Tour will also host the second year of the Team Challenge, an event that pits ski and snowboard brands against each other, and the popular streetstyle competition in downtown Breckenridge. Dew Tour might be the first televised qualifier, but it’s not the first Summit County stop for Olymic hopefuls. 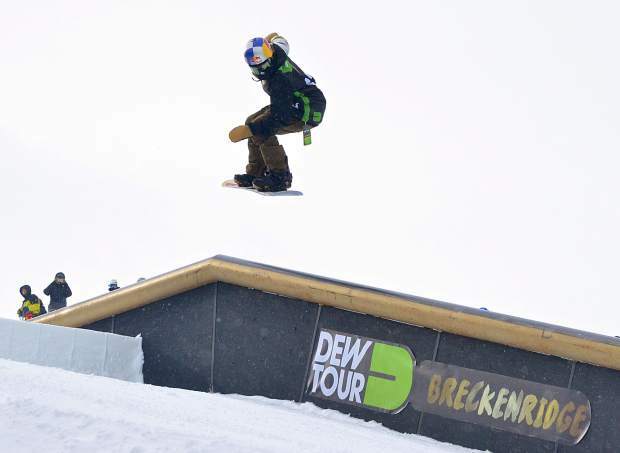 Dew Tour previously served as a qualifier for the 2014 Games in Sochi, and this season, it joins the Toyota U.S. Grand Prix series at Copper Mountain (Dec. 6-10) and Snowmass (Jan 10-14) as three of four stateside qualifiers. In other words, Colorado has a monopoly on training — and choosing — the nation’s best. So what’s at stake this December? A trip to the big show: The world’s best male and female snowboarders and freeskiers will compete for spots to represent the United States at the 23rd Olympic Winter Games in Pyeongchang, South Korea, held Feb. 9-25.